There is one thing that every big city cannot be borne and live without. Water is the only vital source that exists on the Earth and we cannot hold out even a day without it. Therefore every capital city has a river flowing through the very center of it. 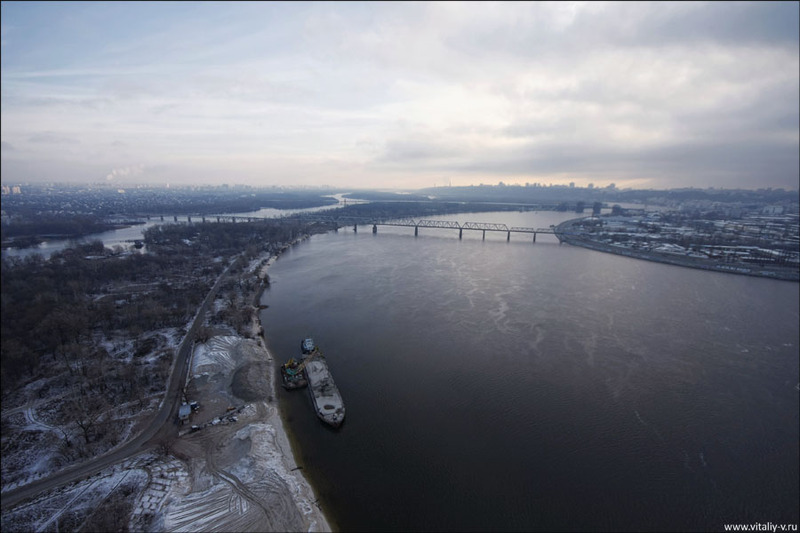 And so Dnepr the Great streams through the center of Ukraine’s capital, the city of Kiev. 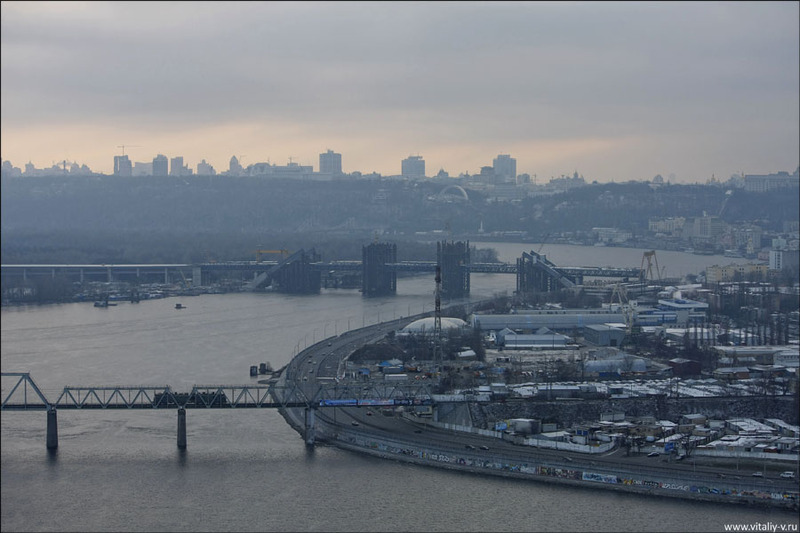 There are lots of bridges that are built in Kiev but today we will tell you about the longest and busiest one. 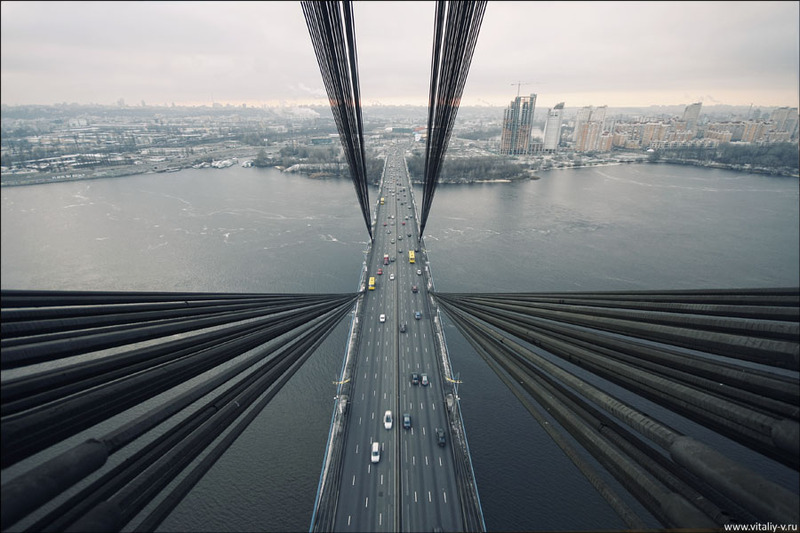 Moscow Bridge. The bridge was opened for use in 1976 and still plays a crucial role in the life of the city and its infrastructure. 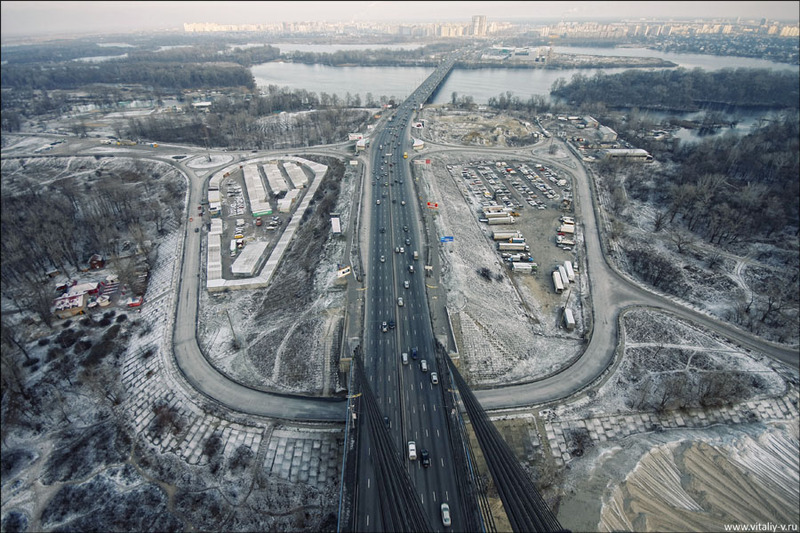 It comprises three parts: cable bridges cross Dnepr as long as 816m (2677 feet), bridge across Desyonka river 732m (2400 feet) in length and a crossover 55m or 180 feet in length. 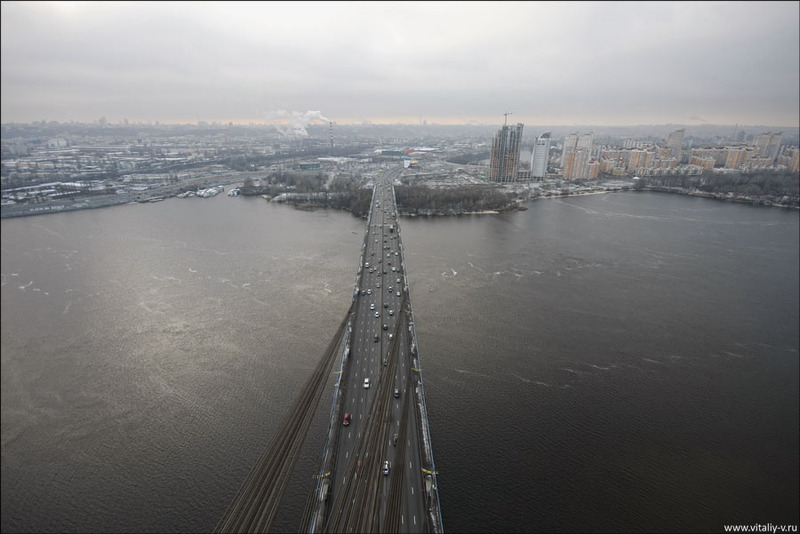 In an exposure draft it had supposed to have 3 lanes in every direction, but some time after the draft was reconsidered and the bridge was built with 4 lanes in every direction. In the end of 80’s there was a trackless line laid there. 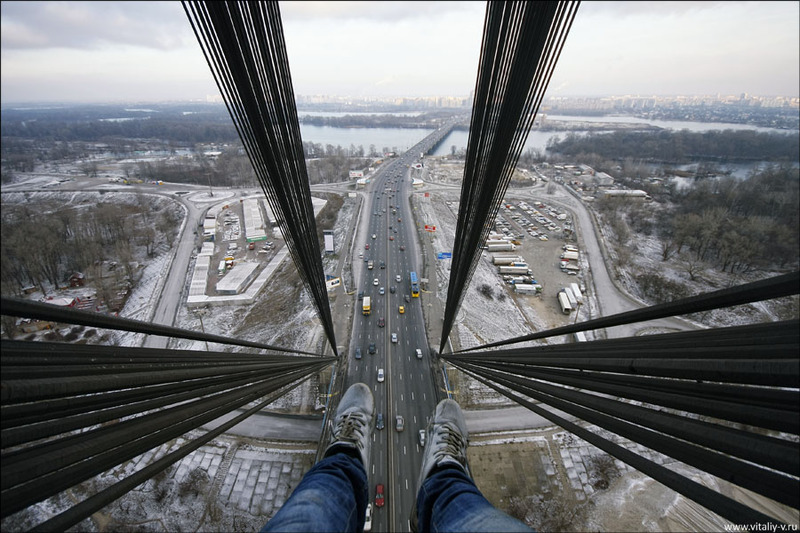 It is 400 feet high and a photographer was forced to stand just on a pad while taking shots. Every time as a truck had driven along the bridge these two pads started shaking as hell. I’m too scary just with looking at these shots, can’t really imagine what the author experienced. 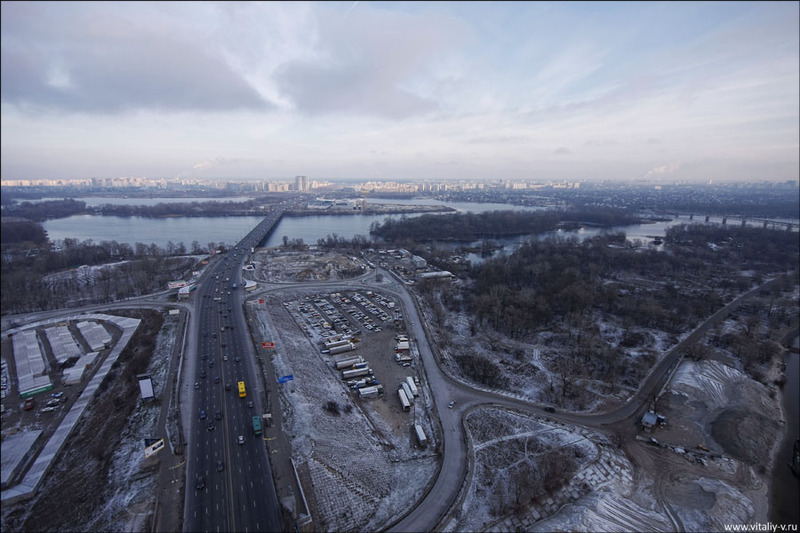 The emblem of Kiev is located at the height of 400 feet and made of some plastic of an unknown origin. 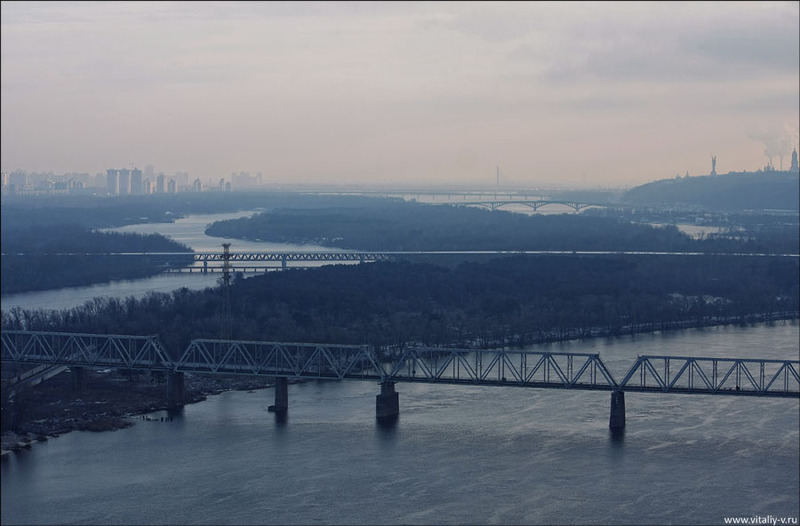 On the horizon you can see Kiev’s monument of Mother Russia and Petrovsky railroad bridge. Five bridges in a row. Kiev just abounds in these. This is an experimental house of a deflected position, 1700 feet and 24 entrances altogether. 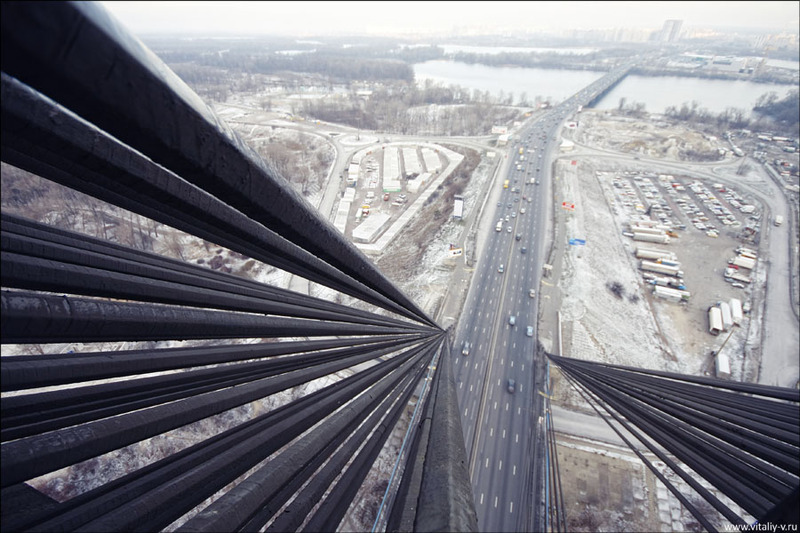 Absolutely dizzying photos, well done! 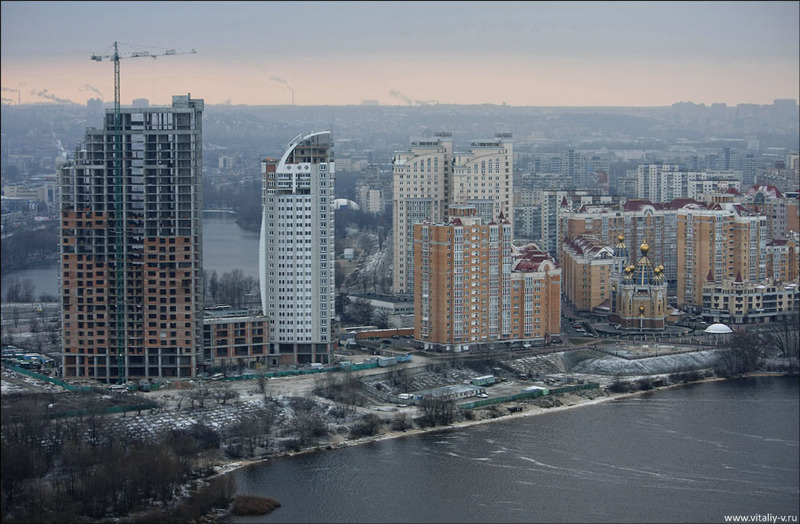 Looks like a beautiful city compared to Moscow and Leningrad. Oh!, I’m first, what do I win? I would like to go there. OMG What a rush that must of been! Fantastic photographs, Thank You! LMAO Okay! Do you like leather, hot wax and peppermint? 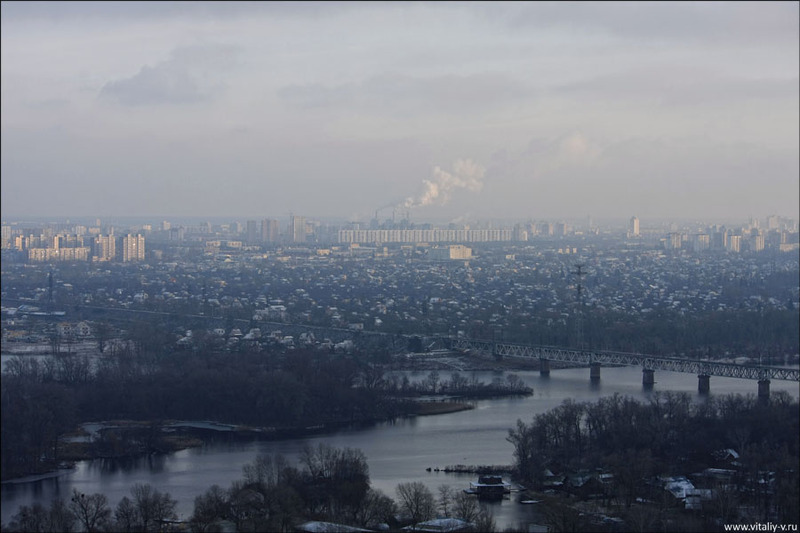 Kiev is a pretty nice city and much smaller than Moscow, but I wouldn´t say that it is more beautiful. Actually, ST Petersburg is more beautiful than Moscow. 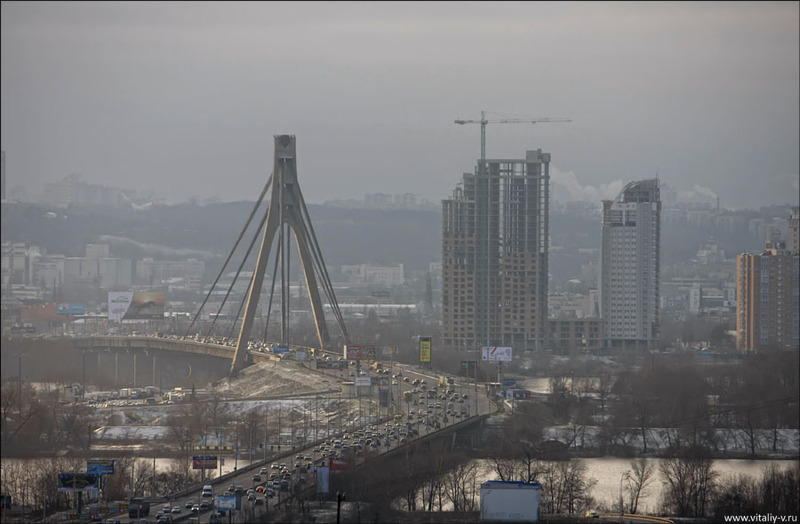 Kiev can be worth visiting if you have seen the best and most famous parts of the world, but be careful visiting Kiev; as soon as you get of the plane in Borispil airport, be prepared to be ripped and everyone will try to fool you to earn some extra cash. Yes, it is not the only place in the world where tourists get ripped; maybe you have been in Thailand, Marocco or Egypt and you know what I am talking about, but in Kiev/Ukraine, it is worse, trust me. But there, you will not find anyone who wants to trade your daughter for 50-camels! 🙂 Nice photos btw! I would gladly trade my daughter for just 1 camel! Vertigo… Climbing up there? This is something completely beyond me. Great pictures. But the City looks kind industrial. And Grey. Maybe its this time of the year. LOL I hate when you do that! 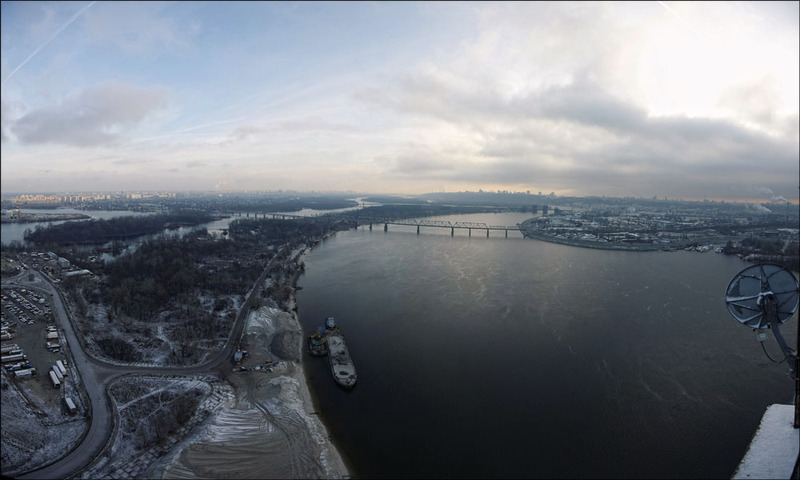 I have been to Kyiv, amazing city. I would love to go back there. I think that the next time I go will be for longer, maybe a month or so. two weeks was just not enough time to see everything that I wanted to. beautiful pics BTW. 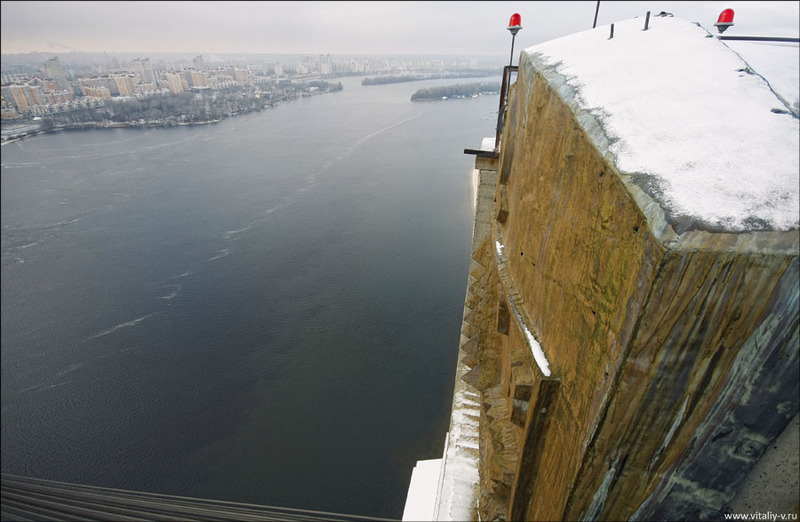 Kiev’s monument of Mother Russia>/i> – FAIL. 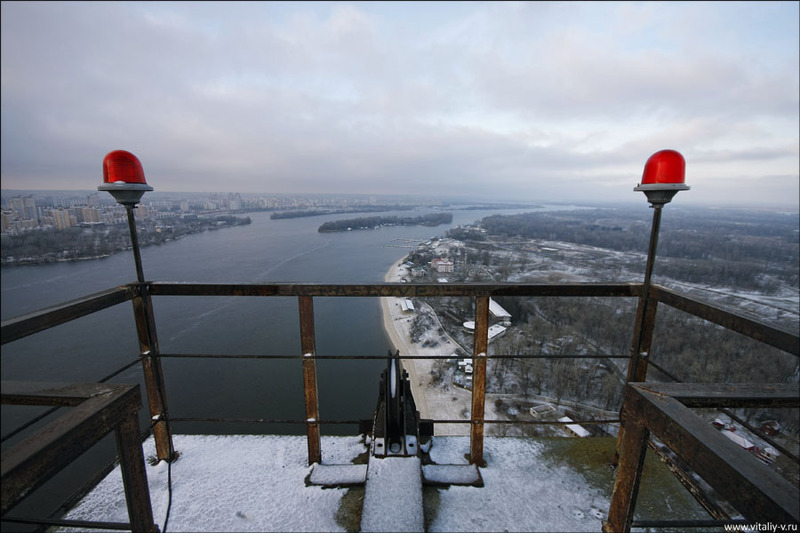 Great photos, and Kiev is certainly an amazing city which I would recommend anyone visit (just not in winter, it gets a touch chilly!). I wonder if DubLi can make an all-inclusive trip there one of their next auctions? I’d certainly take it. Whoever climbed up there deserves respect; must be a brave guy. 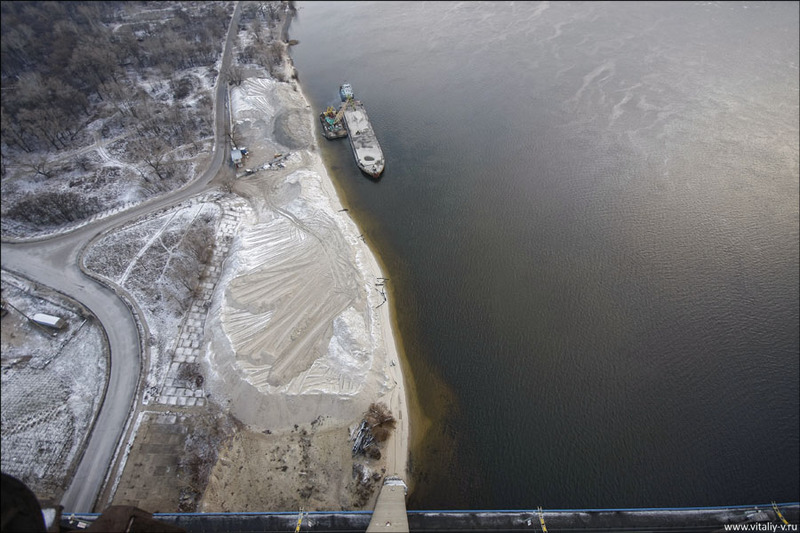 Thats online half the size of the Mississippi 5280 feet (1 mile). The Vicksburg bridge for example is 12,974 feet (3,954 m) putting this to shame! Or how about the GW bridge in New York, 4,760 ft (1,450 m), which has 8 lanes on the upper deck and 6 on the lower deck, also allowing bicycles and pedestrians to cross it. Not Mother Russia monument, but Mother Motherland, literally. Well, the post is in reality the best on this worthw hile topic. I agree with your conclusions and will thirstily look forward to your next updates. Saying thanks will not just be sufficient, for the exceptional lucidity in your writing. I will right absent grab your rss feed to stay privy of any updates! The capital city of Kosovo – Pristina, does not have a river. You do not need to deviate from what you know to be true. Hi, I think DubLi is so awesome.